Wheeler regrets that she cannot send money, but does send one of the books the library needs from the list in the Southern Highlander. 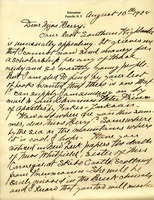 She alerts Berry to the death of Miss Whitfield and sends news of the illness of Anna Grimes, her companion's daughter. 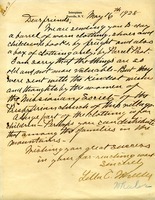 Wheeler sends notice of the shipment of clothing, shoes, and children's books, on behalf of the Portville Missionary Society.